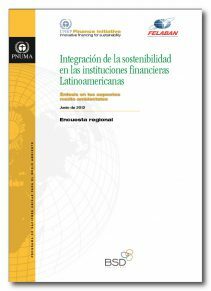 This report is the result of a pan-regional survey conducted among 85 financial institutions in 19 countries on how the Latin American financial sector has integrated sustainability in its activities. This is the most important effort ever undertaken in the region on this subject. The report includes 19 case studies of good practices. It is available in Spanish.